I have been toastmaster for 10 years and pride myself on the work I do for my clients. Peter Burrows is an expert in procedure and etiquette whose aim is to co-ordinate and steer the event to the clients requirements, with the degree of formality appropriate to that event with both sensitivity and empathy. He is at ease in less formal situations where only a gentle, guiding hand is needed. Nowadays, experienced toastmasters are being utilised at conferences and company presentations, as they have that rare combination of tact, diplomacy and management skills for the effective direction of large numbers of people. I live in Poynton, Cheshire with my wife. We have 3 sons and 4 grandchildren who keep us young and very active! We have been foster parents for a number of years which has been a very fulfilling experience. 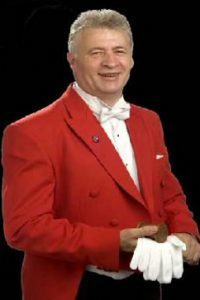 A toastmasters presence adds style and professionalism to every occasion, and the familiar red coat adds colour to the day. 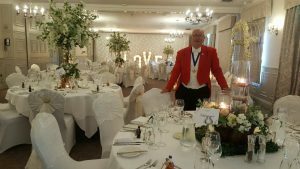 The toastmaster’s expertise ensures that every event, however formal or informal. Runs smoothly and fulfils the highest expectations of the host and hostess or organisers.